You can always be sure of beautifully baked scones, a good dollop of jam and fresh clotted cream, neatly cut sandwiches and a selection of (almost) too-beautiful-to-eat cakes at these afternoon tea locations in and around Bristol. Not only the home of Banksy, Bristol is also host to a wealth of brilliant street art, as well as graffiti tours and festivals. 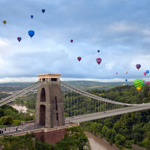 Bristol is a great destination for a family trip and we pride ourselves on being a family-friendly city, offering entertainment for kids of all ages. Discover the city with our ultimate list of the best things to see and do in Bristol in 2019!